There is much more than meets the eye behind that four word question. On the surface, and in most instances, the cry, “God, where are you?” is one of intense emotion caused by tragic loss, shock, betrayal, anguish, fear, and grief. It is an expression of emotion that defies description. And most of the time it is a sincere, honest question; a question asked in faith; a question born of intense desire to sense God’s presence, His comfort in our time of need. But, sometimes the question can be more of a statement really. An accusation to be more precise. A statement-disguised as a question-accusing God of not doing His job. Like an absentee father when he is needed most; not caring for us as he should because he didn’t protect or deliver us from our suffering like he seemed to promise; or better yet, an absentee father who doesn’t love us enough to prevent the tragic circumstances in the first place! How many of those questions have you asked? Are there answers? Yes. In time. Maybe now, maybe not now. Depends on your readiness for the answers. Now may be your time to mourn and weep. If so; no answer, no article, no blog, and no book is going to stop the grief, the mourning, or the weeping. Nor should it. Not for awhile at least. But hope and comfort are always in season. And you can find hope and comfort even in the midst of great suffering, great mourning; comfort and strength to get you through the suffering, the mourning, and the weeping. The fact that you even asked the question, “God, where are you?” proves that hope flickers within you and that you are seeking to stoke that flicker to a full blaze. Times of building and healing will come for you, and when you are ready, there are answers. When ready, there is an answer to the question of God’s presence in the midst of trauma. There is a way to find God and all the help, strength and comfort He has to offer. You can learn what the great saints of the faith throughout the ages have learned in their time of healing and restoration when asking the very same questions you ask. 2 “Today also my complaint is bitter; my hand is heavy on account of my groaning. 3 Oh, that I knew where I might find him, that I might come even to his seat! 8 “Behold, I go forward, but he is not there, and backward, but I do not perceive him; 9 on the left hand when he is working, I do not behold him; he turns to the right hand, but I do not see him. I too have asked similar questions. After losing my family, ministry, and possessions through divorce, I too asked where God was. After two deployments to Iraq as a chaplain; dealing with the injustice of war, the strain of deployments on Soldiers and their families, and the senseless loss of life; I too asked where God was in the midst of tragedy. I too asked why it seemed He didn’t answer when I called out to Him. And I too found the answers to those questions. Just as Job did. Just as Martha did. Just as Mary did. Just as you can. When Job found the answers, all he lost was restored to him two times over. When Mary and Martha found the answers, their brother was restored to them once more. When I found the answers; my ministry, faith, hope, joy, peace, my relationship with my kids; all were restored. When you discover the answers to the questions, “God, where are you? What do you want from me? What must I do now?” you too will experience the restoration God promises; for then He will begin fighting, working, causing all things to come together for good in your life. What others may have meant for evil…God intends for good, for you. The first step to finding the answers you seek is recognizing you are in a battle against circumstances that you cannot control; recognizing you are in a battle you cannot win on your own; recognizing you face enemies you cannot defeat or control. Oh sure, we do what we can to prepare for the many circumstances we face in life’s battles. We polish our resume. We eat right. We exercise. We read, How to Win Friends and Influence People. We go to counseling. We budget. We plan for retirement. We do all we can to put the odds in our favor. But at the end of the day, they are just that. Odds. Are they not? Can you control other people? Can you control your own declining health or the health of your loved ones? Can you guarantee that you will never get sick or that you will recover from an illness or disease? Can you control the tornadoes, floods, earthquakes, fires, tsunamis, pestilence, drought or any of the other myriad forms of natural disasters that afflict us? Can you control the economy, the job market, interest rates, or the stock market? Can you control the opinions of others, the behavior of your kids, the emotions of your spouse or significant other? Can you control any of the thousand other circumstances that might affect you? Can you keep drunk drivers from crossing lanes or terrorists from attacking? Can you guarantee your kids will respect you, obey you, or never hurt you? Can you be assured you will never be served divorce papers, pink slips, or positive test results? Can you force others to hire you, like you, love you? Of course not. Not without Jedi mind powers, you can’t. The only thing you can really control in all of life is your response to these circumstances. And if you were really honest, could you honestly say that you are always in control of yourself? Even if you were to win every battle, achieve every victory, beat down every challenge life threw at you-acing the game of life-there will come a time when death comes for you. Then what? Can you control death’s arrival? Can you control where death will take you? No. No to all of the above. No. If you are going to win the battles of life, you are going to need an Ally. An Ally who CAN control all of those things. An Ally who CAN cause all of them to work together for your good. If you are going to win the battles of your life, you must enlist an Ally who has the power, the wisdom, and the love to join you in those battles; to do for you the good, you cannot do for yourself. To win the spiritual, relational, physical, financial, and emotional battles of your life, you are going to need Jesus, The Greatest Warrior. You may have never thought about Jesus as a warrior. You probably think of Him simply as a man of peace. You would be correct. He is, in fact, the Prince of Peace. But He is so much more than just a man, and He is certainly much more than just a man of peace. He is the Son of God and He is The Mighty Warrior who, on our behalf, has already fought and won the greatest battle of our lives; the spiritual battle for our lives. You see, Jesus came to this world to do for us what we could never do ourselves; perfectly obey every command of God; maintain perfect, unbroken fellowship with God. We couldn’t. Jesus did. Perfectly. Every day of His life. And then, at the end of His life, he laid down that perfect life on the cross; He died the death we should’ve died, so that we might experience the kind of eternal life He now lives. He did all this so that He might make a way for us to be brought back into a relationship with God. He won that life for us when He rose from the dead three days later; proving His life to be sinless; securing our spiritual victory over sin and death. Through that spiritual victory, He now makes it possible for us to be more than conquerors in all these other things. Thingsin this life and, more importantly, in the life to come. How can we experience this victory? How can we find Him in the midst of all we are going through? What must we do to get Him to take up our cause, to secure our good? What must we do to enlist the power of God to heal our hurt, restore our joy, and guarantee our victory in the battles of life? These are the two most important steps, but they are the first in a lifetime of steps on the journey toward victory and eternity. 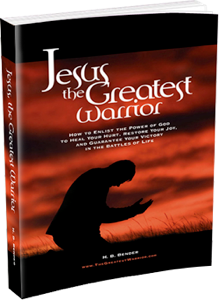 For help with the rest of your journey I recommend the book, Jesus, The Greatest Warrior. What you must do to gain access to all the power, wisdom, and love God has for you so that you may experience a peace and abundance you never knew possible; a joy, a peace, a blessing, and an abundance no circumstance, no situation, and no person will be able to take from you. How to KNOW that you have eternal life. How to know with 100% certainty that you will go to Heaven; to never again experience sadness, disappointment, rejection, illness, poverty, insufficiency, abuse, shame or injustice, where you will be made perfect forevermore. How to be set free from all the guilt and shame of your past, how to be given a fresh start, and how to be released from the limitations that come with being defined by your past mistakes and the opinions of others. How to make sense of the struggles you are going through. To know why we experience pain and suffering in this life. To know how your pain and suffering is actually PROOF of God’s love for you, proof that you will overcome. The secret to navigating the storms of life and experience a happiness and joy that transcends your circumstances. What to do when you lose your way in those storms and how to get back on course. How to know God loves you. That He loves you just because you are. That He has never stopped loving you, and that He will love you always. Unconditionally. Perfectly. Completely. Eternally. Never leave you in your fallen condition. Or, if you prefer, you may order your copy of Jesus, The Greatest Warrior at www.amazon.com. Order your copy today and discover how to let Jesus secure victory for you and glory for Him in the battles of life. 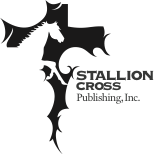 Copyright 2010 Stallion cross Publishing. All Rights Reserved.